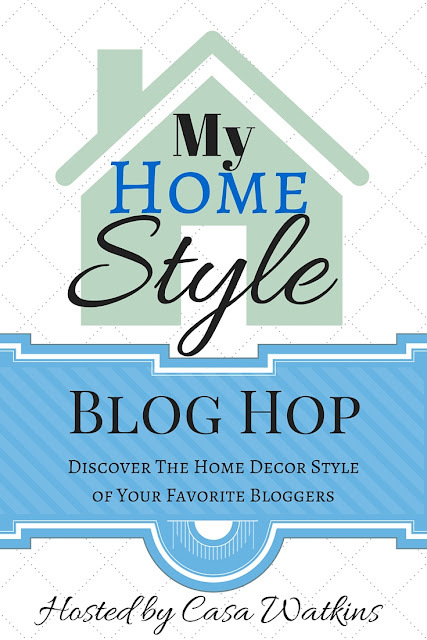 I was recently challenged by a blogger friend to describe my home style and I realized I didn’t really know. 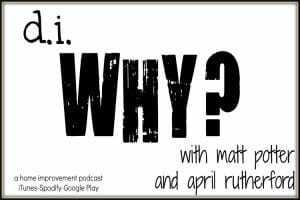 When she suggested that we do a blog hop describing our style, I had to ask some friends and neighbors what they thought. So, if it’s your first time here, I’m so glad you “hopped” over. I’m April and I finally decided my style, summed up in three words, would be industrial, modern and funky. To be honest, I’m not entirely set on those three words, but it’s been really fun to think about. Industrial was the easy one. 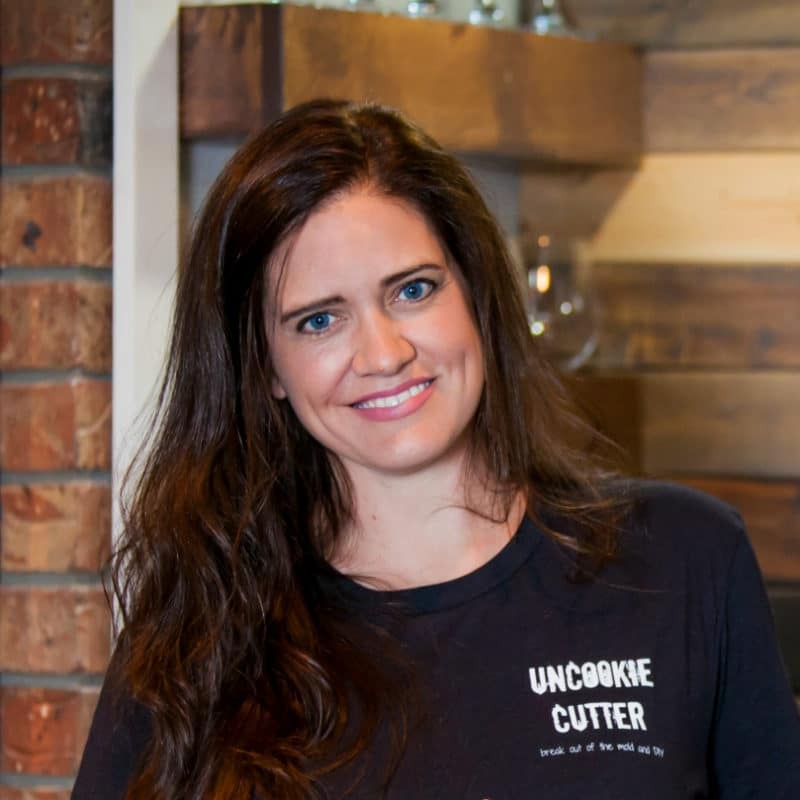 When I think of industrial, I think of things like exposed brick, metal and exposed piping. We have a huge wall that I haven’t touched because the other walls are rather busy and I love the brick and don’t want to cover it up. We also have a brick fireplace as well, and I made a TV surround shelf that hides my cords and stores our DVD player and cable box. I used PVC pipes and made them look like iron pipes. See that post HERE. And since I had used the faux pipe, I incorporated the industrial pipe a few other places. Since these project were a bit smaller, I used actual plumbing pipe. It seems to be very popular right now and it’s super easy to use. 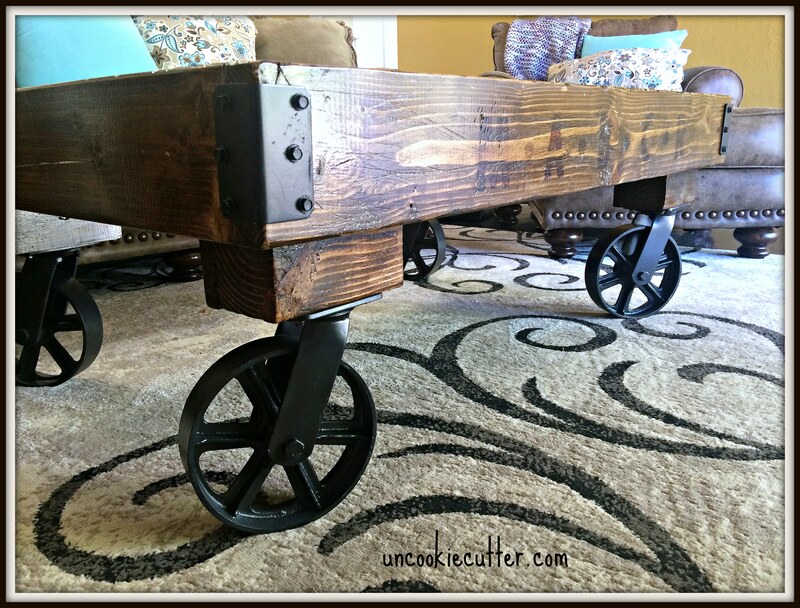 I also used these super cool large wheels to build a coffee table that I could pull up to the couch and work on and I love it! So, modern is the word I’m not super sure about. Trendy might be a better word. I recently built our concrete top dining table and it is trendy and industrial. I am working my way through the dining room now and trying to finish some very modern chairs. I can’t wait to share those with you all, so stick around ;). 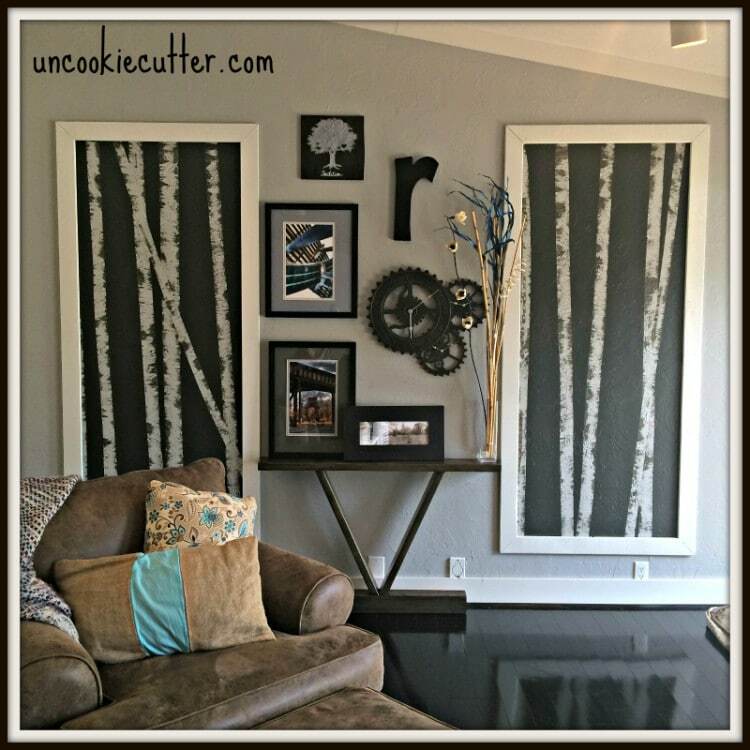 I also love my birch tree paintings that were so easy and HERE is full tutorial on them, the gallery wall and little table I built. The word funky came from my husband. 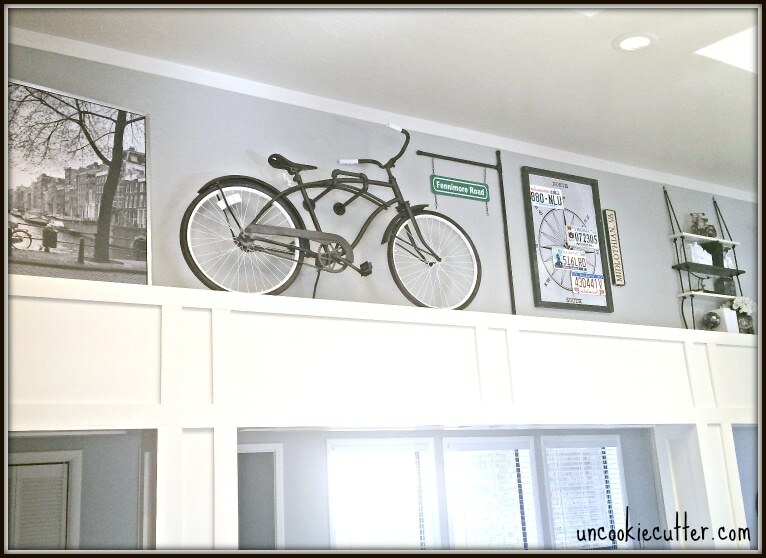 When I put up things like my little tree stump end table and antique bike as decor, he looked at me like I was crazy. So, my whole main room set up looks like this (sorry for the bad photography). There are lots of other DIY projects in this room, so feel free to look around and if you have any questions, feel free to ask! When you are done perusing around here, make sure you head over to Plum Doodles, who is next on the hop and then visit all of my friends and try and figure out your style, if you don’t already know! Beautiful, April! I have such an appreciation for Industrial decor. 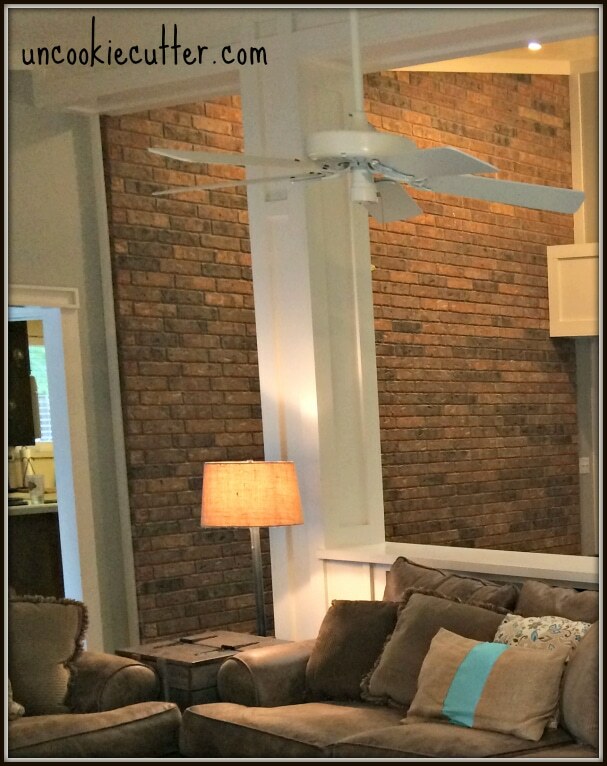 Your exposed brick wall has be swooning! I think my husband would love for me to have chosen it as our decorating direction in our new home, but somehow the coastal vibe took me over. Otherwise, you can bet, we’d be on the same page! 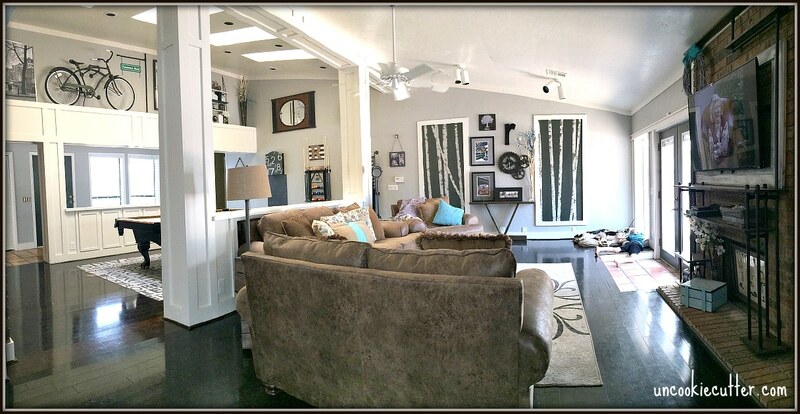 Thanks for sharing your gorgeous home with us! Thanks so much Iris! I didn’t know I was going to go industrail when we move in, but with so much brick and trying to incoporate a game room into the living area, it just sorta happened. And you NAILED coastal! April!!! Love your home and your style! 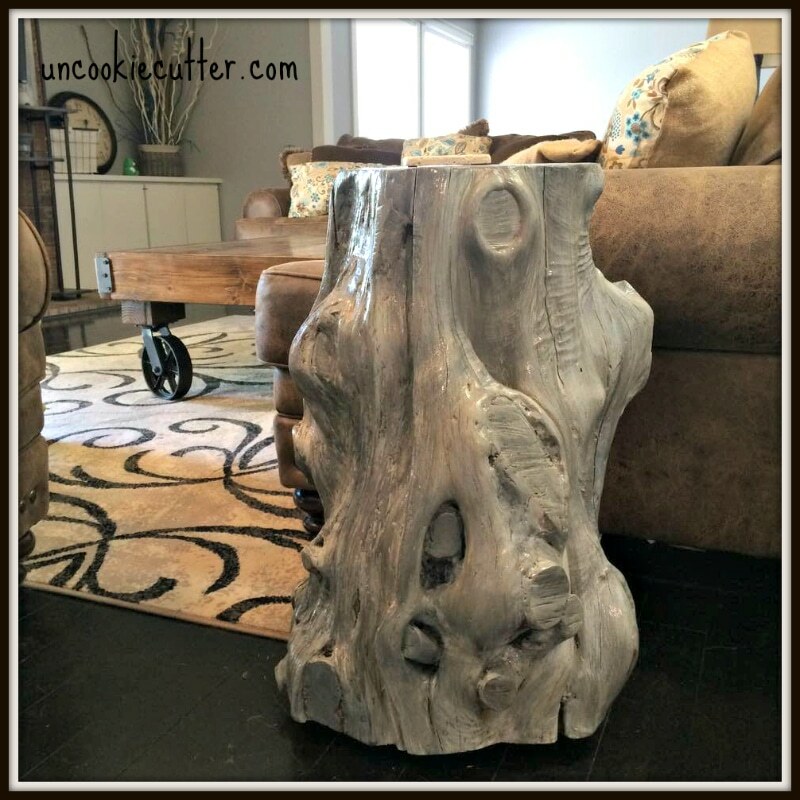 Your concrete top table is so awesome and I absolutely love that antique bike! Wow, there are so many things I would be tempted to steal from you! 😀 Seriously, I adore the coffee table and the rug underneath. And the bike. And the tree stump. Great style, April! Thanks so much Sheila! Glad we connected! I love your home and your style. Your style is so unique and different…it stands out from the crowd. Good job and I have enjoyed all of your projects. Hi, April! I think you picked the right terms to describe your style. 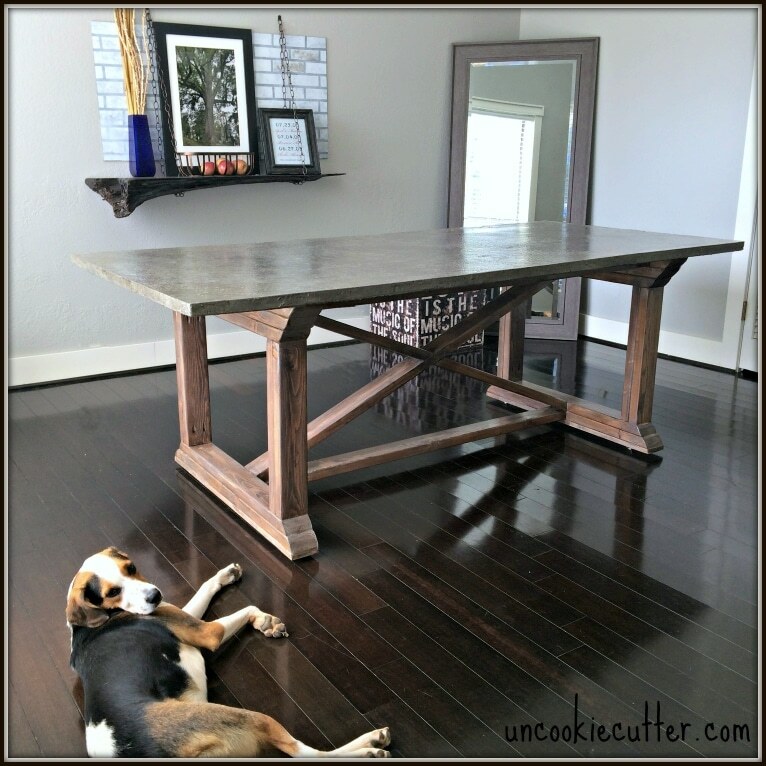 I’m so impressed with your DIY table (and your cute dog!) and love the birch tree project. Enjoyed “hopping” with you! I love all the diy touches you’ve added to your home. And I am so impressed with all of the things you have built! That coffee table is amazing! Hi April……Your home is wonderful. There are so many things I love about your home, but like you I really like that brick wall and that is a great bike. Great style! I am a bike person too —I love what you did with the vintage bike. And I’m going to give the birch tree project a whirl. We spend summers in northern Michigan where birch trees abound. Would love to have a few in our house! Well done. Thank you Shelley and can’t wait to see your birch trees! Love your style April. 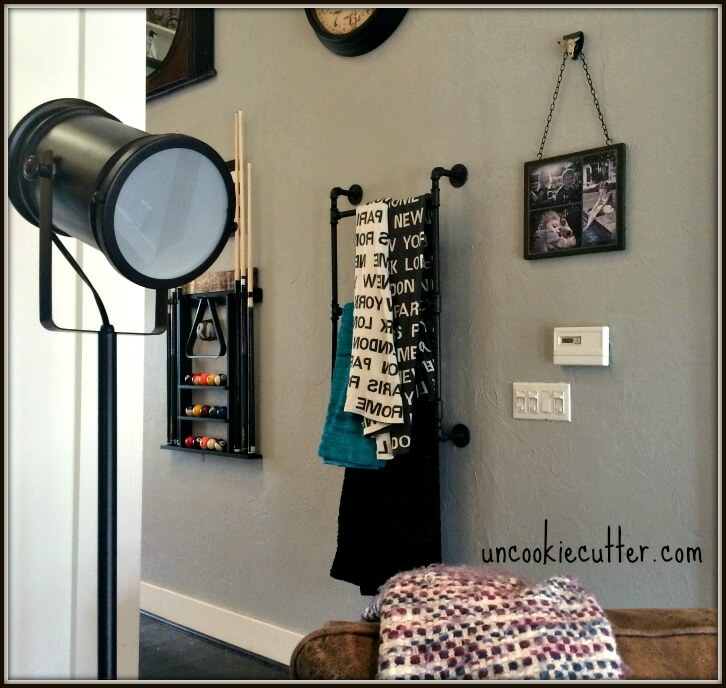 I just adore how you make a lot of your furniture DIY style! So creative. Your home is so cohesive too. 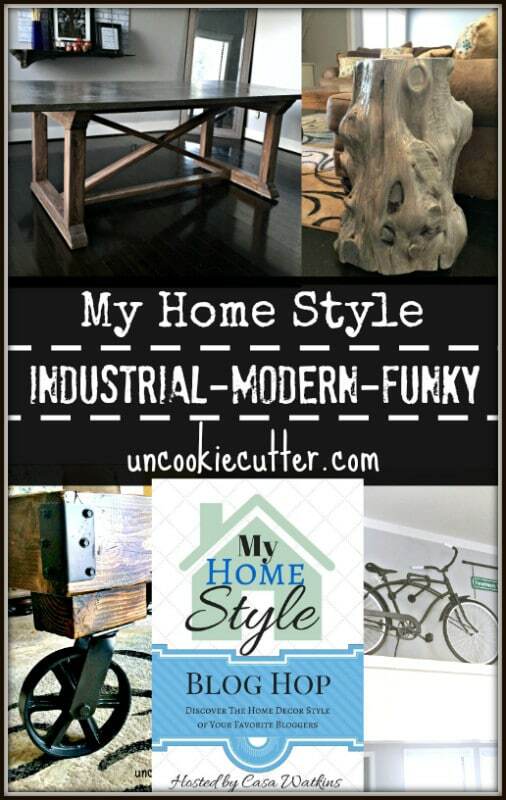 I see the industrial, modern, funky style in all your rooms and DIY projects. Love it! Pinned and Shared. Thanks so much Stephanie and thanks again for hosting :)!! I love seeing the whole room in that last picture. So pretty!! The dining table you just finished is amazing and I love the exposed brick wall. I love the funky in your space. Personalization is important to make a space your own otherwise it’s just generic.